It has been a very social week, and we both knew it would be this way as our stay is winding down and we have lots of folks to have one more visit with before we go. Jim and Sue and headed that way. 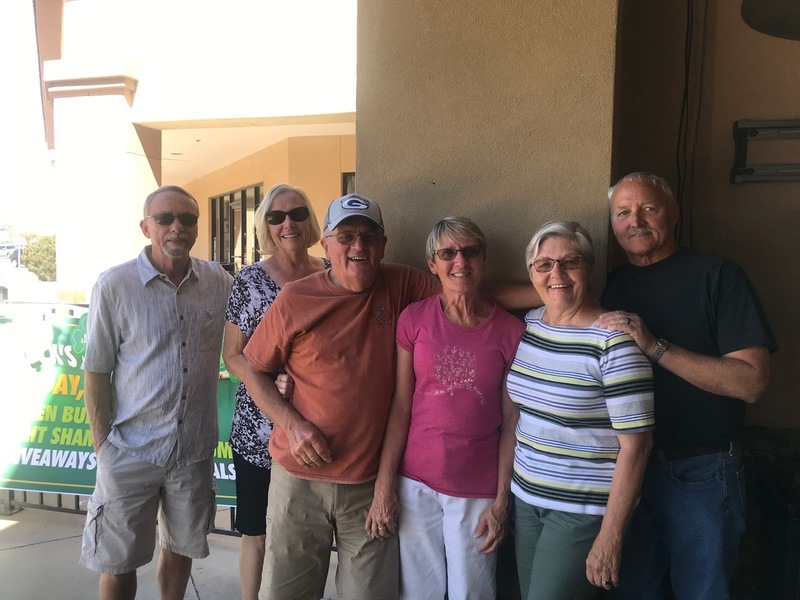 The Sunscape RV Park that they are in is very nice and Roger’s first news was that they rented a spot there for next November-April at half the price of Val Vista Village. So we walked the dogs and swung around to see which site he rented and it is very nice and the neighbors all seem quite friendly. It was lunch time, so we drove to Casa Grande to McMashers Sports Bar and had a beer and some tasty lunch. Back at their site, we found some shade and visited for a while before we headed back home. Tuesday was a work day for me and after that, I shopped at Costco, Petsmart, and Tuesday Morning before heading home. Tom spent the day emptying out his storage unit and taking things to Chaneyks garage to be stored. Wednesday was a good day to take a nice walk and to get our laundry out of the way and clean up the house a bit. The new vacuum cleaner that I bought a couple of months ago makes it a whole lot easier to control the dog hair that piles up every couple of days. I also spent some time grooming the little hair ball, giving him a good brushing, including his teeth. 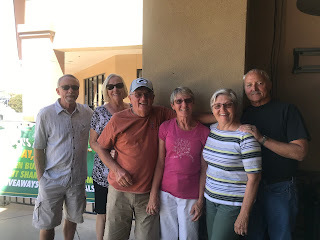 We arranged a gathering of mostly Wisconsin friends for a picnic at Castillo Nuevo with Pat & Rog, Sue & Jim, Chris & Norm, Carl & Vianne, and Gerry & Jeanie on Thursday afternoon. It was the coolest day of the week, so we gathered in long pants and jackets at the courtyard where we were protected from the wind. Tom and I picked up Sub sandwiches and everyone brought a dish to pass - we had plenty of food and drink and lots of great conversation and laughter. And then we said goodbye until we meet again, either in Wisconsin or Minnesota during the summer or back here in the fall. And today, we picked up Arlene and Sharla and headed to the Lakeshore Restaurant at Saguaro Lake. We had a nice table on the outdoor patio overlooking the lake and a good lunch of fish and chips, although the fish was a bit over-cooked and slightly dry. While there, we noticed a bit of activity in the parking lot with several Sheriff’s department vehicles and an ambulance with flashing lights on. And then a Sheriff’s department helicopter landed on the pad, but took off again shortly after, heading over the lake and disappearing behind the mountains. It wasn’t long and another helicopter landed on the pad and the pilot and an attendant unloaded a stretcher and some other gear. We watched for quite a while as they attended to someone and then loaded the injured person into the helicopter and took off. As we were leaving, Sharla learned that a lady had fallen at the restaurant and gotten a head injury. The first helicopter landing was unrelated to the injury. It sure gave us something to talk and speculate about - not like we ever have a problem finding things to talk about. We sure did have a nice time and talked about how much we appreciated each other as neighbors at Highlands and kind of miss those days.